The region is filled with winds from stars, funnels of gas, and star formation, all embedded within a haze of gas and dust. Central region of the Lagoon Nebula, showing the Hourglass Nebula to the right. Three images from the ESO GigaGalaxy Zoom project. Dive into the Lagoon Nebula. 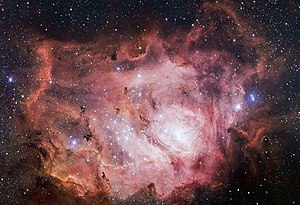 ↑ The images show the sky at different levels: from the view seen by the unaided eye to one seen through an amateur telescope, with a final zoom in onto the Lagoon Nebula as seen through a professional telescope.